Android 9 also helps you get things done faster with App Actions, which predicts what you’ll want to do next based on your context and displays that action right on your phone. Say it’s Tuesday morning and you’re preparing for your commute: you’ll be suggested actions like navigating to work on Google Maps or resuming an audiobook with Google Play Books. And when you put in headphones after work, you may see options to call your mum or start your favorite Spotify playlist. Making your phone smarter and more adaptive is important, but we also want Android to be easier to use and more approachable. In Android 9, we’ve introduced a new system navigation featuring a single home button. This is especially helpful as phones grow taller and it’s more difficult to get things done on your phone with one hand. With a single, clean home button, you can swipe up to see a newly designed Overview, the spot where at a glance you have full-screen previews of your recently used apps. Swipe up from anywhere to see full-screen previews of recently used apps and simply tap to jump back into one of them. If you find yourself constantly switching between apps on your Pixel, we’ve got good news for you: Smart Text Selection (which recognizes the meaning of the text you’re selecting and suggests relevant actions) now works on the Overview of your recent apps, making it easier to perform the action you want. 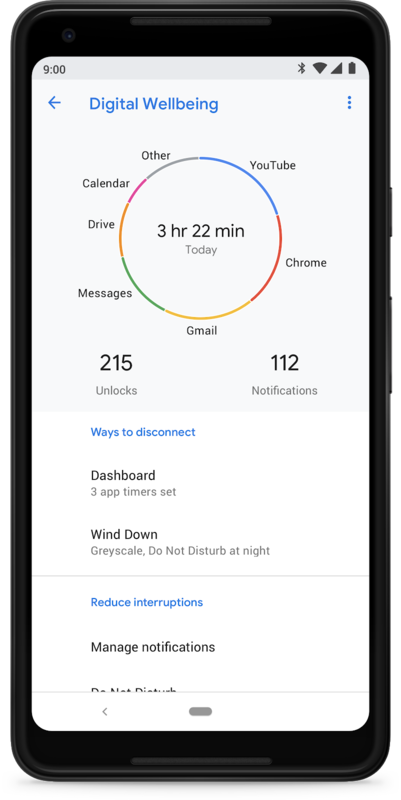 You can enable this new system navigation in Settings once you’ve received your update to Android 9 (learn more in the help center).